Politics has no permanent friend and foe. And this has been proved a couple of times. Again, with unexpected events, we will have to end this year in politics. Patrick Shanahan, chair of the University of Washington’s board of regent, gave a speech in a negative tone when Trump was elected as the President saying all was not lost. He had urged the community to stay together and be prepared for the anticipated change. Two years later, Shanahan was appointed as the confidant of Trump. 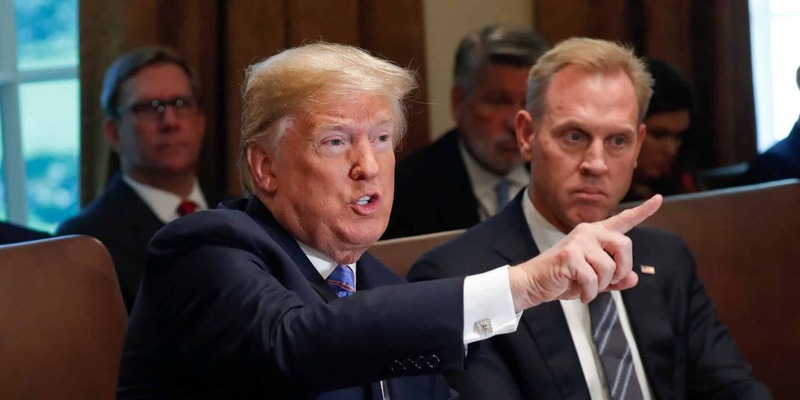 On Sunday, Trump announced that he would appoint Shanahan, currently serving as Deputy Secretary of Defense as the next secretary of defense on an interim basis starting next January. As in the other departments, Trump has once again appointed someone who has no experience in the designated field. Shanahan comes with no military experience. But, he promises to bring business acumen what he had gained serving for a decade at Boeing and what helped him to rise to the Senior Vice President in Boeing. As he had been with Boeing, there was no political impression of his work, but his six-year stint at the University of Washington governing body gives us a glimpse of his way of work. He had a different yet effective approach towards ambitious campus expansion and student unrest. As a regent in the University, he has been known for his conservative attitude towards expenditure, and no one can confirm his political views. He had donated for both the Democratic and Republicans. The University of Washington’s President Ana Mari Cauce recalled Shanahan as an active and engaged regent and praised him for his leadership qualities and leadership decisions. She even told that owing to his career at Boeing he tried to cut the cost in areas that were not directly related to core missions and very supportive towards spending for students’ experience. Joe Buccino, the spokesperson for Shanahan, said he was not available for any further comment. He also said that he was a proud son of his father who was a Vietnam veteran and a long-serving police chief at the University of Washington. As per Buccino, Shanahan is very vocal about his father’s achievements and the kind of work he has been into inspires him. It should be reported here that Shanahan, 56 has grown up in Seattle, graduating from Bishop Blanchet High School. His friends remember him as an ambitious boy and a very good football player. After high school, he went to the University of Washington for his mechanical engineering degree. A professor from there termed him as an inspiration to most of his students. At Boeing, Shanahan was quite famous for his work and remembered for turning around projects like 787 Dreamliner which was earlier troubled. Also, he made his mark for his work in defense procurement. Carolyn Corvi, former head of manufacturing for Boeing’s commercial airline division said Shanahan was one of the best men she has worked with. She described him as someone committed to serving his country. During the term of Shanahan, the whole university was seen with many construction works. He arranged $210 million from the Bill and Melinda Gates for a new population-health building. He also started a second computer- science building, life science building, an underground facility for animal research and a new museum for natural history. He often credits his parents for teaching him the way to extract the best from limited resources. At the time of his stint making, the best expenditure used to be the theme in the board meetings. He was once presented with a master plan in 2015, and he has been remembered saying that he would first weigh the trade-off between space and money. In 2016 at the University, during the development of an online service request tool, he pushed for proposals of best quality at the lowest possible cost. Not everything was rosy at the time of his tenure at the University of Washington. The dental school and UW medicine had been facing a lingering problem of finances. The dental school had a deficit of $38 million whereas UW medicine had shown a loss of $76 million. The University of Washington now plans to persuade the legislature for $110 million of funding for University infrastructure and giving a raise to the staff. He has been quite proficient working with students. He has faced students’ fury two times in his University career. When the students tried to take over a meeting which was chaired by Shanahan, he confronted the students and tried to diffuse the situation. As per the various sources, his acumen lies in the way of handling budgets. He has been praised many times for this at multiple workplaces. We should see some of his implementations at the Defense of the U.S. as well. We wish him luck for his new endeavor.